Before we were interrupted by the holidays, I was determined to get the Blog caught up on our September (yes – that really was nearly 4 months ago!) road trip to the Alaskan Interior. 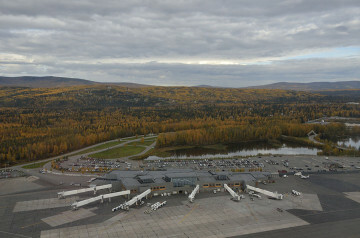 Just to remind you that it was autumn back when we were up in Fairbanks, here’s a photo of the Fairbanks airport as we took off for our flight up to Barrow, 320 miles above the Arctic Circle. 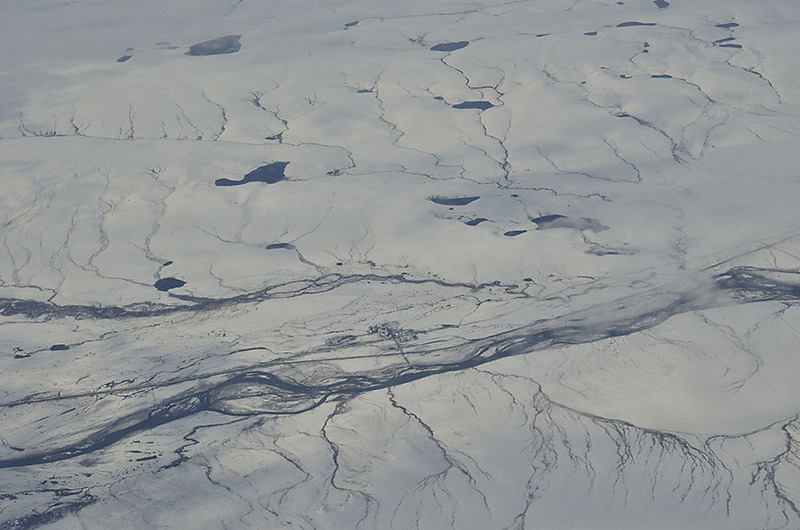 North of the Brooks Range, the land is mostly flat tundra with roaming caribou and musk ox. And you can see that there isn’t much to protect the land from storms coming off the Chukchi Sea. 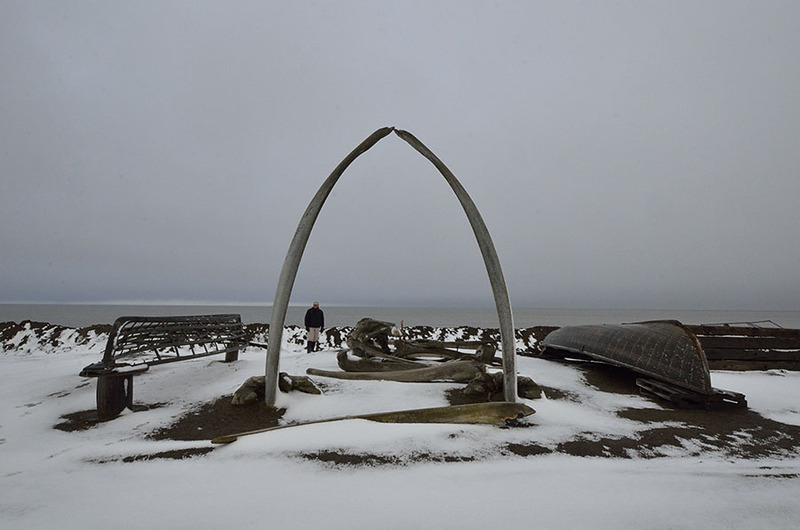 Barrow is the northernmost city in the US with a population of about 4200 people, most of whom are Inupiat native who must rely on subsistence hunting for a large percentage of their food. 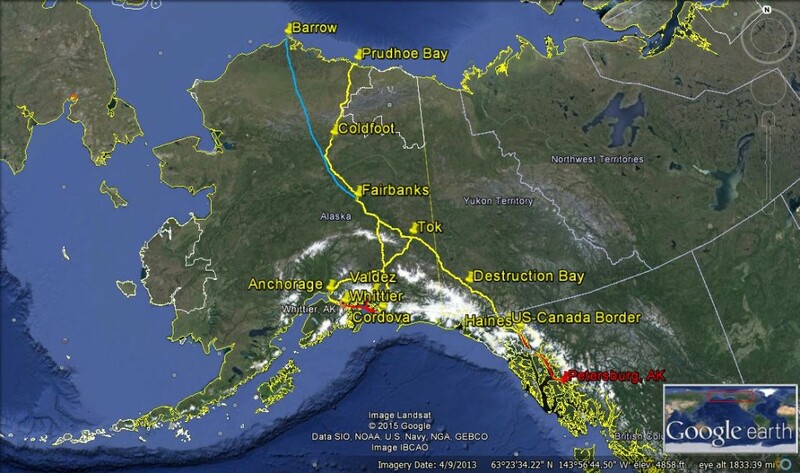 Barrow is accessible ONLY by air (year round) or by water during a short period in the summer months. The town has a fuel storage facility since they receive all their fuel for the entire year in one barge delivery each summer. Can you imagine accurately estimating all the fuel needs for a town – for cars, ATVs, snowmachines, trucks, heavy equipment, generators and heating for a year? The supply has to be carefully monitored and budgeted to make sure they don’t run out, and the cost at the pump is about $7/gallon. Aside from subsistence hunting, all food must be brought in on the summer barge or by air, so you can imagine that it’s very expensive. In addition to being practical, hunting is an integral part of the Inupiat culture – helping each other and sharing meat among the elders in the community. The most important food source for the Inupiat is the bowhead whale. They differ greatly from the Japanese whaling ships which take as many whales as they can. 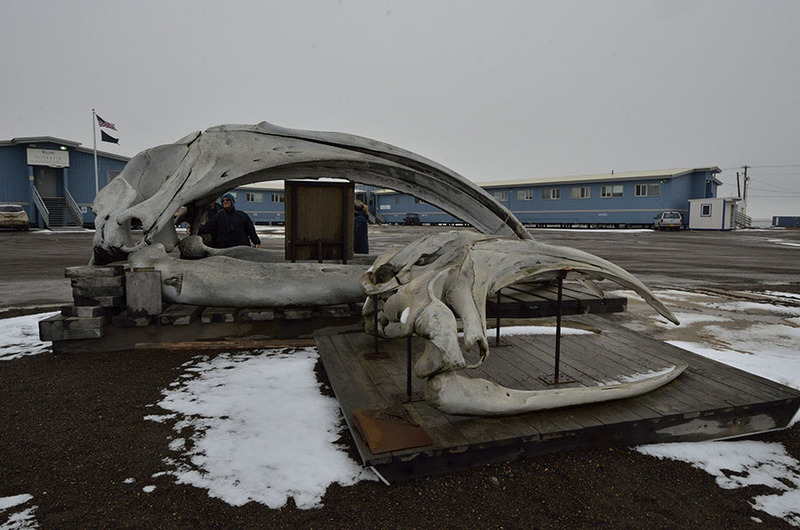 The Inupiat’s two annual hunts (spring and fall) are regulated to limit the number of whales taken (the quota was 12 strikes for the late September fall hunt) to protect the Arctic Ocean population, and the hunt is conducted using many of the same traditional methods that the Inupiat have been using for thousands of years. The spring hunt is done from the edge of the shore-bound ice, and the whaling teams camp out on the ice waiting for a bowhead to come close enough for the hand-thrown harpoon, or sometimes they may venture a short distance in a traditional skin boat (made from the hide of bearded seals). The harpoon has a small incendiary device designed to detonate inside the whale’s head in order to dispatch the animal instantly and humanely. Another native with a rifle stands by to fire an additional killing shot immediately afterwards, if necessary. The Inupiat take great care to respect and honor the whale’s sacrifice, and scientists use the whale harvest to further study the bowhead. Did you know that the whale’s eye can reveal its age? The community helps with all the work getting the whale ashore and harvesting the meat. Cooperation and teamwork are deeply rooted in their culture, and the many skills and lessons are taught to children at an early age. After distribution among the community members and elders, the meat is stored in ice cellars – deep holes dug into the permafrost. The Inupiat Cultural Center in Barrow is an excellent place to learn more about this group of polar native people, and we were lucky to have an Inupiat woman guide us through the museum and weave examples from her childhood and adult life into her interpretation. We arranged for the tour through the Top of the World Hotel, one of the very few hotels in Barrow. 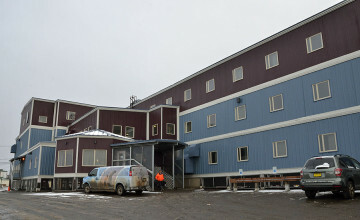 Notice that the hotel is built up on stilts to protect the permafrost. Everything in Barrow is very very expensive, but it’s no surprise since it’s not easy to get things up here. You can see by the photos that we had pretty gloomy weather for our weekend visit. 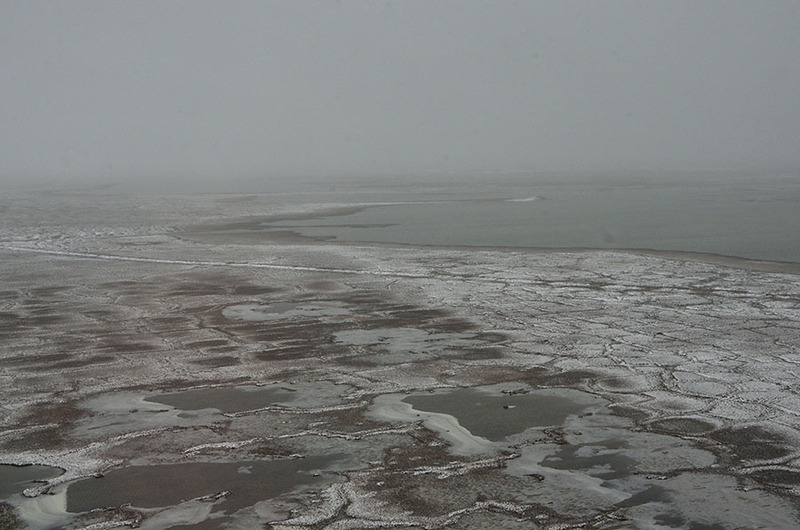 Barrow is overcast for more than 50% of the year, and sitting right on the shore of the Chukchi Sea and well above the Arctic Circle you can imagine that the weather there isn’t often very nice. In fact, the town sits right up against the ocean beach which can be problematic. When we were there in mid-September crews were still clearing sand washed over the road from a storm. We dressed in our warmest hats and tall insulated boots and had a ball beach combing in the surf, finding funky fat marine worms and many beautiful rocks in unusual colors. Another reason to visit Barrow is to see snowy owls, which feed on the little lemmings that live on the tundra. 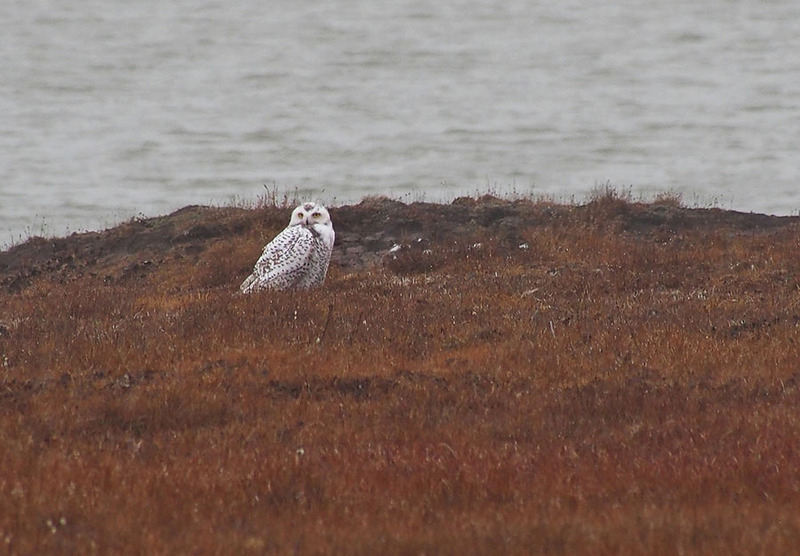 Barrow’s Inupiat name is “Ukpeagvik” which translates to “The Place Where We Hunt Snowy Owls”. 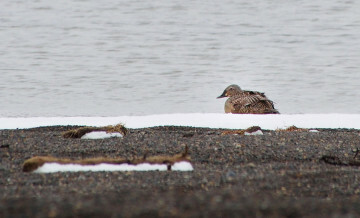 The weather and time of year weren’t the best for finding owls, but we did see some, as well as snow buntings, parasitic jaegers and eider ducks. Climate change and sea level rise are very real for these Arctic people. 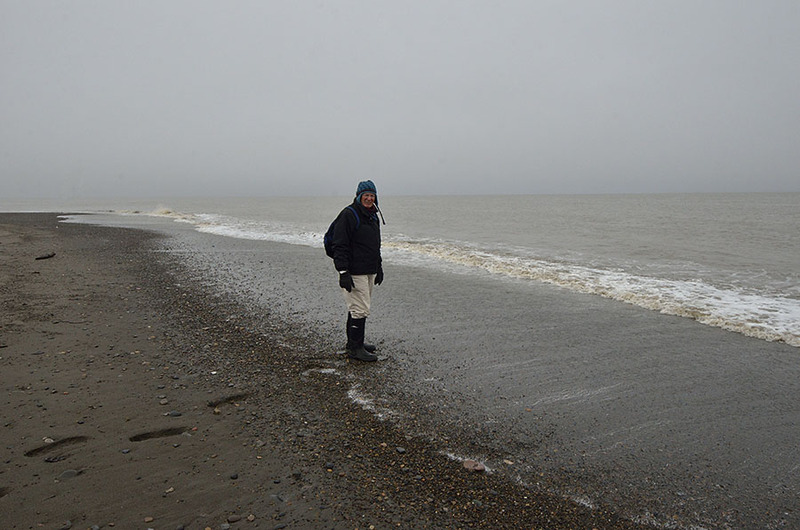 The road is washed out more often by storms, and sea ice forms later in the year (and is thinner), making it more difficult for hunting as well as for the marine mammals that rely on the ice for habitat. Two small cruise ships are making a stop in Barrow once a year now that the Northwest Passage is open on a more consistent basis. Polar bears are a real danger on the outskirts of Barrow, and their behavior is changing as their habitat is impacted by the loss of sea ice. 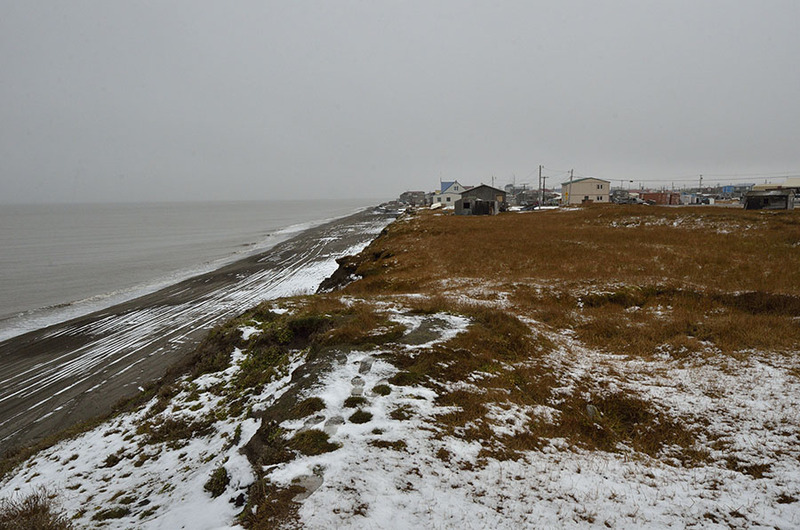 The guidebook for Barrow cautions people about exploring along the beach outside of town, warning that polar bears are apex predators and that they will absolutely hunt humans. We stuck with our local guide for this visit. Barrow is a fascinating place, and we’d like to explore it further in the warmer months when there are more birds around. The culture and living challenges for the native people are amazing, especially when you consider that they have thrived in this harsh environment for thousands of years. What a fascinating place, story and photos. So glad you made this trip, enjoyed it, learned so much, and shared it! Gorgeous snowy owl, and wow, those people are TOUGH! Hope your winter is going well. We’re traveling in the SW for winter but flying home for 10 days for the Boat Show. At Big Bend National Park in SW Texas now.